Location: Quebec city - South shore. Fly in a gyrocopter (Autogyro) with an instructor very close to Quebec City. 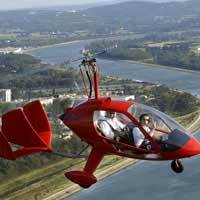 The gyroplane (Gyro) is an hybrid aircraft between a helicopter and an airplane. An unforgettable experience. Maximum weight of 240 lb. Open all year round.